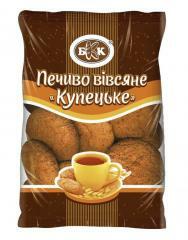 "NUTLETS WITH CONDENSED MILK" COOKIES OF TM "ЧАРІВНИЦЯ"
expiration date - 2 months. in shock frosts - 12 months. after defrosting - 2 months. 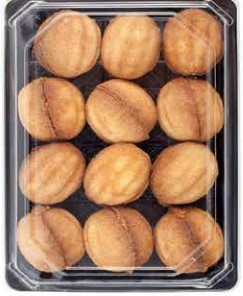 Cookies consist from two halves of shortcake, in the form of nutlets. Halves are filled and connected among themselves by a dairy stuffing "Toffee". The delicacy loved since the childhood which cannot be forgotten, – nutlets from shortcake dough with condensed milk. Taste of this dessert very saturated, rich and at the same time gentle therefore sometimes so there is a wish to please itself and the family with these cookies. Unbelievable price on The "Nutlets with Condensed Milk" cookies from two halves of shortcake, in the form of nutlets, are filled with a dairy stuffing "Toffee". Weight, kg: 0,525, 2,0, 4,0. GOST. in Vatutine (Ukraine) company Kombinat baranochnyh izdelij, OOO.